The modernist Spyros Papaloukas also contributed to bridging 20th-century Greek art with contemporary movements, with which he came into contact in Paris. In his work, he took advantage of the Post-Impressionist achievements, alongside the teaching of Byzantine art. 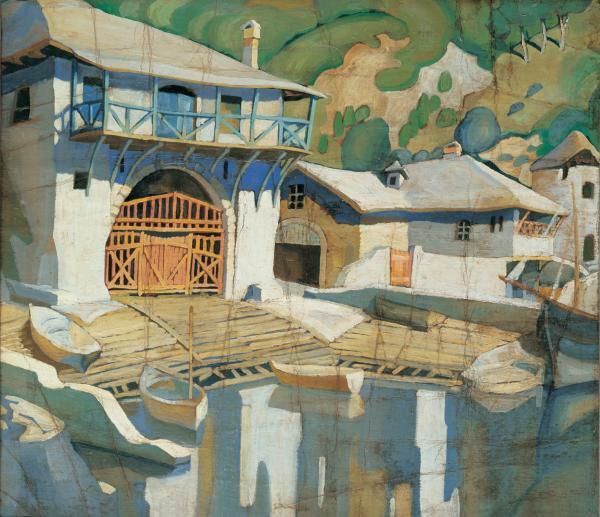 His stay on Mount Athos, in 1924, was to be a catalyst in his creative career, as it furnished the artist with the motifs to which he applied his investigations regarding colour, light and compositional architecture. Monasteries, sketes, cells, houses are all rendered in a painterly fashion, translating the artist’s experience of living on Mount Athos. In horizontal format, his Boatyard on Mount Athos, with the boatyard buildings and boats in the foreground, with the reflections on the water and the vegetation that rounds off the composition in the top right, is seen from up close. The painter opted for a colour palette without tonal climaxes – warm golden ochres for the buildings and cool blues for the foreground – keeping his composition strictly flat on the painted surface. He studied at the Athens School of Fine Arts (1909-1916) and went on to study in Paris, at the Grande Chaumière and Julian academies. In 1922he participated in the Asia Minor Campaign as a war artist. The works he made were destroyed in Smyrna, after having being on display atthe Zappeion Hall in Athens. In 1923 he retired to Aegina and then to Mount Athos, and painted the works that went on display in his first soloexhibition, in 1924 in Thessaloniki. In 1925 he lived on Lesbos for six months, became professor at the Cottage Industry School and made copiesafter the mosaics in the Church of Agios Loukas. In 1926 he visited Salamina and the following year was commissiont to paint the Metropolisin Amfissa. It was then that he also started to work as a stage designer. He was a founding member of the ‘Techni’ group of artists (1936) andone of the publishers of the art review ?? ????? ???? [The third eye]. In 1940 he became the director of the Municipal Gallery in Athens. From 1943to 1951 he taught at the National Technical University in Athens and in 1956 became professor at the Athens School of Fine Arts. He is one of the pioneers of 20th-century Greek art. Having assimilated the teachings of Byzantine art and introducing the achievements of thecontemporary European movements which he had explored in Paris, he painted landscapes, portraits, still-life paintings and everyday scenes.